It has been so sunny here in London for the past few days and quite pleasant. However, there was a heavy downpour yesterday out of the blue and it reminded me of monsoons in India. When it pours continuously the whole day, it gets really cold and there is nothing you want more than family and friends around you and hot sweet tea with something savoury to munch. Hubby was at office so I decided to make the most basic Indian comfort food with the ultimate munch factor, chooda. No matter which part of India you go to, it exists and rules. The way of preparation might be different and the ingredients might be native to the region, but you can always find some stocked in air tight boxes in the store room. Mom used to pack some homemade chooda (prepared according to my specifications of course) when I would leave for college after my vacations. MIL has her own way of making it. The beauty is you can mould it according to your own tastes. Despite so many varieties, unfortunately, I could not find any of the recipes on any of the food blogs. Hopefully this article will be able to guide chooda enthusiasts in the right direction. Basically, you can make chooda as rich as you like or as diet oriented as you like. I have chosen the middle path here. There is very little oil but a lot of crunchy bits and pieces in it. Before diving into the ingredient list, you need a huge air tight container first. Go for a 5 litre one atleast as the prepared ingredients expand in size and take up more space. I used a 7 litre box and believe me, it got full by the time I was over with the dish. Heat a large wok and spread 1 tbsp oil in it so it coats the inside evenly. Wait till the wok is hot. Turn down the heat and put in 2 cup pohe. Use two wooden spoons to fold the pohe like you would fold noodles. This prevents the pohe from breaking and coats them with oil evenly. Cook till pohe are crisp. Transfer to a the large container. Repeat the process till all pohe is prepared. Spoon in 1 tbsp of oil and add 2 tsp turmeric powder. Mix and put in 2 cups of laayi. Again fold in as you did for pohe. The difference this time is that the laayi will not only become crisp but also get a lovely yellow color. Make sure the laayi is evenly yellow all over. You can make pohe also yellow like this. Repeat the process you used for pohe till all laayi is prepared. Transfer to the same container as pohe. Add 1 tbsp oil in the same wok and roast the peanuts in it. Transfer to the container. Repeat the process with dalwa. 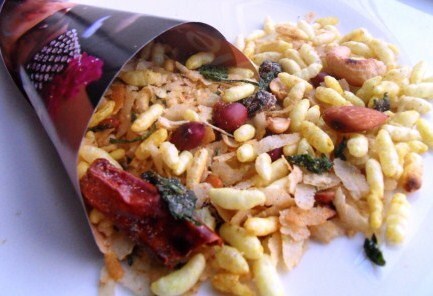 You can also add roasted chana. Break the cashewnuts into halves. Add 1 tsp oil in the same wok and roast them till light pink. Transfer to the container. Repeat the process with almonds. Another ingredient you can use is slivered dry coconut. Break off the leaves of coriander and chop them. Roast them in 1 tbsp oil till crispy. This gives a lovely colour to the chooda. You can also use curry leaves in its place. Heat two tbsp oil in the wok and add mustard seeds to it. When they start to pop, tear the red chillies into halves and put in the wok. Add 4-5 tbsp salt and 2 tbsp red chilli powder and stir for 2 seconds. Pour it in the container. Grind the sugar and add 2 tbsp to the chooda mix. Take a big spoon and mix all the ingredients in the container carefully. Adjust the flavours with table salt, black salt, red chilli powder, sugar and chaat powder. Everything is mixed together in the end but prepared separately as the cooking time for each ingredient is different. This might lead to one ingredient being overcooked and the other undercooked. Put the lid back on till the next time.